My name is Matt Winick from Ann Arbor, Michigan and I have a strong interest in studying history and social justice. In these subjects, I like to learn the need to make Civil Rights stronger to reduce discrimination, protect the environment from pollution, and many others. 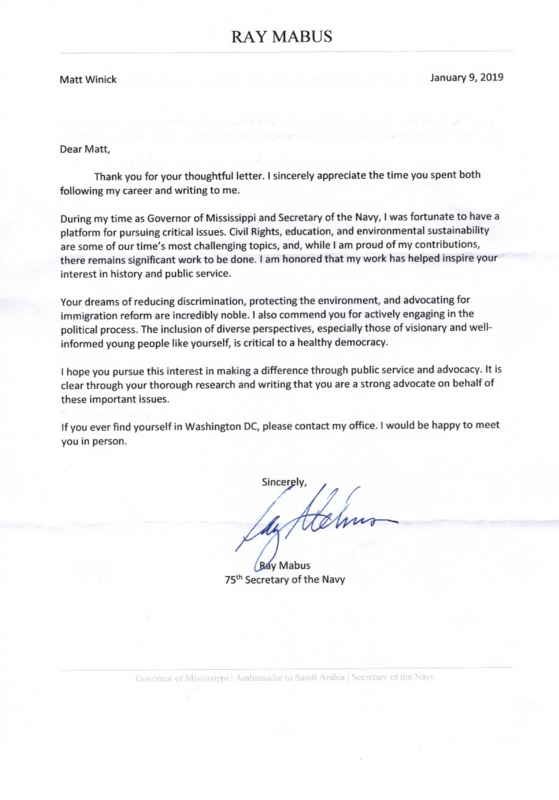 Honorable Mabus, the main reason I’m writing you a letter is to explain how I find your work when you served as 60th Governor of Mississippi and as 75th U.S. Secretary of the Navy to be very inspiring to me. When you served as 60th Governor of Mississippi from 1988-1992, I truly appreciate on how you were a strong supporter of Civil Rights by advocating for people with disabilities’ rights, supporting funds for women including minorities businesses, and expanding laws to combat against hate-crime to help protect minorities including people who are different. On education I liked on how you created the B.E.S.T. (Better Education for Success Tomorrow) to help increase funds for special education to help students with disabilities get the educational accommodations to assist them on learning, expand more after school programs to provide students with help on their assignments from tutors, and implement more history, arts, and basic classes to make education diverse. Expanding job-training programs to help train youth including workers to develop work-skills to help prepare for the economy and advocating for the need to increase the minimum wage to help assist minimum wage workers afford to live is common sense to improve the economy. To protect the environment, I liked on how you supported funds for renewable energy resources to help reduce addiction to oil with gas and pushed for more funds to help clean parks, water resources, and coastal to help reduce pollution while make them safe for people to use. When you served as 75th U.S. Secretary of the Navy from 2009-2017, I liked on how you were a continuous strong supporter of Civil Rights, advocate for people with disabilities’ rights, and pushing for the Navy to hire more women including minorities. Advocating for the need for the Navy to use renewable energy with alternative energy as an energy source to reduce our addiction to oil with gas and working with President Obama on creating Gulf Coast Restoration Plan where you team up with different states including local towns, communities, and tribunal areas work on a plan to find ways to fix the ecosystem from the BP gulf oil spill with finding ways to improve protecting the environment is common sense to protect the environment. Also I liked on how you made Navy carriers like aviation with military vehicles use biofuel with finding ways to make technology more energy efficient to reduce our addiction to oil with gas. Another thing that I liked about your work as U.S. Secretary of Navy was how you expressed the need to improve GI bill to help veterans, U.S. troops, and people who serve in the navy get help on getting an education along with jobs and pushed for funds to improve military gear including technology to help protect the U.S. troops along with national security. After you left public service, I really like on how you are continuing to support Civil Rights, express the need to protect the environment while reduce climate change, the importance of immigration reform to help protect immigrants including refugees from being oppressed, and many others. Honorable Mabus, I have autism with a learning disability. Having a disability is hard for me because I have trouble comprehending on learning different advance subjects, sometimes I struggle to communicate my thoughts, and get teased. Your commitment to be a strong supporter of Civil Rights including people with disabilities’ rights really inspires me to work hard on my disability. Also your role as 60th Governor of Mississippi and as 75th U.S. Secretary of the Navy gives me motivation to continue to learn history including social justice. My future goal is to someday work in these areas to help emphasize the need to make Civil Rights stronger to reduce discrimination, protect the environment from pollution, the importance of immigration reform to help protect immigrants including refugees from being oppressed, and many others. I strongly believe that you made a great difference when you served in public service. I’m very proud on how you worked hard to support Civil Rights, push to improve the Navy including U.S. troops, protect the environment, and push for education reform. You have inspired me to work hard on my disability and to continue to learn history including social justice. Also I wanted to say thank you for your service and your commitment to help our country. I would like to get a chance to meet you because you truly inspire me to work hard on my disability and I would like to learn more about your service. Thanks for taking the time to read my letter, working hard to make a great difference for public service, and inspiring me. Please continue to advocate for common sense ideas.